Does the new year have you thinking about new plans? Perhaps even a new Keller Home? Our quick move-in homes can help you start the year on the right foot; we have a wonderful selection of plans, features and pricing throughout our communities that can help you get into a new home even sooner than you may think! Here's a sneak peek at our first available homes of 2018. Variety, variety, variety. Our Cordera quick move-in homes offer both single- and two-story living. Each boasts at least four bedrooms and a three-car garage. The Ellingwood is a ranch plan with a fully finished basement (9' ceilings), main-level study and covered patio. 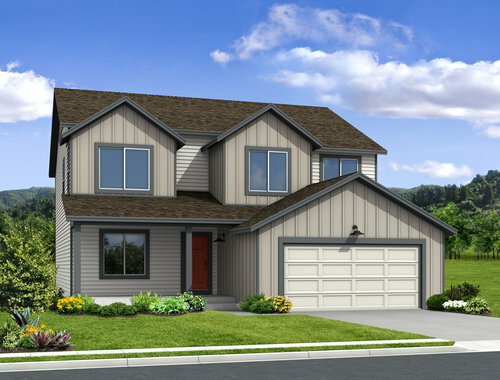 Two of our our popular Ellington homes are already underway, as well; both offer mountain views, designer finishes and a flexible floor plan, perfect for family living. Our Fremont home (shown above) showcases some of our most popular features, like a curbless shower at the master bathroom, media built-ins, a main-floor study and American Heritage architecture. Lastly, our Jackson home - another fan favorite - boasts views and a 2-story layout with main-level study and upstairs laundry. All four quick move-in homes will be ready by March 2018. Need a little more time? Our newest homesites in Cordera will become available for pre-sale in late March, with construction beginning in late spring. Stay tuned for more information! Looking for low-maintenance? Don't miss our newest Mid-Century Modern enclave in Cordera, Élan. Click here to learn more. Our first quick move-in home in Cumbre Vista is already under construction. The Jackson floor plan offers two-story living with four bedrooms (views from the master) and laundry upstairs, as well as a study on the main level. The garden-level basement features a large rec room. We've even included landscaping, rear fencing and designer touches like media built-ins. This home will be available in June 2018. Ready to learn more? Click here to view all of our quick move-in homes or here to contact us! We look forward to serving you.